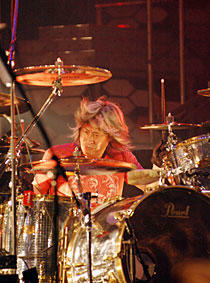 Loudness drummer Munetaka Higuchi died at a hospital in Osaka at 10am on November 30. Higuti had been battling liver cancer since being diagnosed in April of this year. In April, Munetaka Higuchi was diagnosed with liver cell cancer which caused a temporary halt to the band, as he concentrated on treatment. An abnormality was found in the liver and he was hospitalized on April 7, as more tests were conducted. After chemotherapy treatment and an operation to remove part of his liver, sadly he lost the battle with cancer. Loudness guitarist Akira Takasaki confirmed Higuchi’s death through a short post at www.akiratakasaki.com. On October 16th Higuchi released a statement through the official Loudness site (www.loudness.jp) in which he said he was sorry for causing friends and fans to worry.